I went to the lighting of a beacon for the Queen’s 90th birthday last night. I’d seen it advertised via my friend’s facebook post a week ago and had thought: ‘that sounds like quite a nice communal thing to do’ And it also brought back memories of the lighting of beacons in 1977 for the Queen’s Silver Jubilee; one dim and darkened memory in particular, of climbing a farmer’s field to watch a bonfire being lit, with my family. It was an impressively large bonfire I seem to recall. The Facebook post got forgotten until my friend re-posted the event. 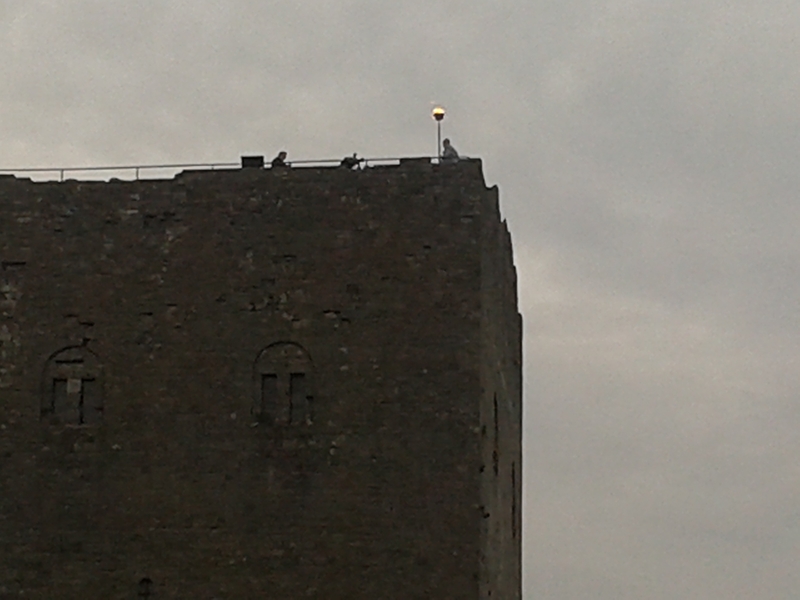 The beacon was to be lit on top of our local castle’s Keep by the Mayor. What a strange word Keep (origin unknown) is; good one though. A Keep is a fortified tower built within a castle. Discovering that the beacon was to be lit at a great height renewed my interest in said birthday event and I rapidly Skyped the husband, in his office, telling him that we would be walking to the castle at 7 pm (the car park was expected to be packed) to get there for 7.30 pm when the beacon would be lit. The husband is a supremely amenable and easy going person and agreed to change his plans for last night and instead walk down to the castle – even though he couldn’t care less about beacons and Queens being 90 or felt any need to take part in a little bit of National Trust history. You never become so acutely aware of your own age than when a celebrity from your generation has kicked the bucket. Why this is I don’t know. I am 7 years off 62. The Grim Reaper suddenly appeared, leaning against the fireplace in the lounge. 62… 62….Christ she was only 62. Maybe I’ve only got 7 years left. ‘Why did you tell me that?’ I remonstrated with the husband. ‘You know I keep away from online News and papers so I don’t hear such things. ‘ ‘You’d have heard about it sooner or later,’ he said. ‘Well, I didn’t wish to know that.’ I replied. Yesterday was a lovely, sunny day in CMB land, so the walk to the castle was a pleasant one. The beacon lighting party had got going at 5 pm but I wasn’t interested in bouncy castles, face painting or eating dodgy burgers from a dodgy van, so we got there just in time to see the much heralded lighting of the beacon. An event that was happening across country apparently. The crowd gathered in the castle was what I would call a meagre one. It was clear that my home town is lacking in overt patriotism. We stood near the entrance and looked up at the Keep. A tiny metal bowl had been perched on top of a metal pole at the edge of the Keep. ‘Is that it?’ I said, remembering the large bonfire from the 1977 Jubilee. ‘Looks like it,’ said the husband, ‘and they’re lighting it when it’s still light too,’ he added. The husband then pointed out that my friend was standing right next to us, something I’d not noticed being occupied in people watching and staring up at the gigantic Keep. The friend and I commiserated with each other on the death of Victoria Wood, mainly from the selfish standpoint that she was practically the same age as us and it really made you think didn’t it? And then we all agreed that they (whoever they were) could have pushed the boat out a bit further with regards to beacon size. An Irish folk band were jigging away on a temporary stand, covered by canvas, and the friend, who is always glued to a smartphone, suddenly piped up (rather like the Irish piper) with the news that Prince had just died. Now, I was still reeling (rather stupidly, since I didn’t know her AT ALL) from the unexpected death of Victoria Wood and the only thing that came to mind was that Prince Charles had died – since I thought my friend had said ‘the Prince’, rather than ‘Prince’ and royalty was currently on my mind. My friend continued with could we believe it, and what the heck was happening that so many famous people were dying on an almost weekly basis and furthermore did we know that Prince was just 57!!! Couldn’t be Charles then thought I. Just imagine though if Charles had popped his royal clogs on his mum’s ancient birthday. 57….57… ‘that’s just 2 years older than me’, the friend and I chimed together; and the Grim Reaper suddenly appeared, beside the Mayor at the top of the Keep. At 7.27 pm the Mayor appeared on high, beside the beacon, and waved at the meagre crowd. I waved back manically, noting that I was about the only one. Then the Irish band stopped jigging about and started a countdown. 10, 9, 8, 7……. The husband started shouting one number ahead – 6 instead of 7 etc – and thought this was hilarious. At the count of 1, the Mayor lit the tiny, invisible beacon and we were all instructed to sing Happy Birthday to the Queen. Not knowing quite what to sing, I went with ‘Happy Birthday to you, Happy Birthday dear Queenie etc etc’. The husband went with ‘Happy birthday to you, squashed tomatoes and stew’ etc etc, much to the amused distaste of my Monarchy-loving friend. And when it was finished the husband started going on about Prince again and that he’d be proved right regarding drug use. All the talk of Prince’s narcotic habits and death in middle-age put quite a dampener on the birthday shenanigans. The husband and I walked home, following the ‘crowd’ out through the castle gates, some of them holding limp union flags and most of them of a certain age. Yes, that’s just the way it is. Still…… I don’t wish to know that.